This is a new year and you need some money motivation. I totally get it. If Christmas didn't scare you into complete money saving mode, your daily finances might have. However, maybe you just need some new ideas or a reminder of some good old ones. This has some easy ideas and some crazy simple ideas to save money. Some of these might seem like they are not so simple, but they really are. 1. Simply don't spend it. We are always buying things we "think" we might need, but truly don't. If money is that tight, don't spend it. Start a spending freeze. 2. Have some change in your pocket? Throw it in a can or a piggy bank to save towards Christmas or a rainy day. You can do the same with your one and five dollar bills. Tuck them into a drawer or a box to save for a special day. 3. Look for the discounted produce at the grocery store or your favorite mass merchandiser. The produce is usually still good for another week or so. You can take it home and use it right away, freeze it, dehydrate it, or can it to use later. You can save a lot of money this way! 4. Buy greeting cards at a dollar store. If you are spending more than a dollar on a card, you spent too much! 5. Didn't like that shampoo? Use it as a body wash. You can do the same with face wash too. 6. Conditioner not working for you? Use it for shaving or as an in-shower lotion. 7. Lost a sock? Use the other sock for a dusting cloth or a washcloth. Just slide on your hand and go! 8. Use handkerchiefs instead of facial tissues. You can use the ones you have in the bottom of your sock or underwear drawer, buy some (the small investment is worth it), or just use cut up old shirts with or without the edges hemmed. The money you save will be worth it and you can just wash them and reuse them constantly. You can also replace napkins this way too. 9. Reuse, reuse, reuse. Even if an item seems disposable, find a way to reuse it. Sometimes you might spend a little more on reusable items, but the cost, in the long run, is much cheaper. 10. Carry your drinks and food with you - for work, play, ball games, and car rides - to save a lot of money. It takes very little time to fill up the water bottles, pack a few drink packets, granola bars, and apples to have in the vehicle with you for your family's and your hunger attacks. 11. Stop eating out. That right there will save you a load of money. If you really like the steak at a certain place, learn to make yourself. Brown bag your lunches for work and get to know your fellow employees (or read a book). 12. Cook from scratch. You may hear this one all the time, but seriously it is a budget saver. I can make a loaf of bread (or two) and a pan of granola bars for less than a decent loaf of bread at the store. Plus, I know what is in both of those things and can pronounce all the ingredients. Bonus. 13. Simply say no to yourself (and to your kids and significant other). That word "no" will be the easiest way to save money. Most of the requests you get from them are extras and not necessities so saying no should be easy. However, don't be a jerk and say no all the time. Sometimes their requests are justified. And no, you don't need that candy bar either. Put it back. 14. Use up your products until the last drop. Add a little water to the soap to get the last bits out. If the pump on the soap doesn't pump anymore, take the pump out and dump it out that way. Cut the container open to get to the product on the bottom. Open up the tube to get the last of the good stuff out. Use it all up! 15. Stop buying the already cut-up produce at the store and cut up your own. The mark-ups on that stuff are crazy expensive! Buy the whole pepper or watermelon and do your own labor. 16. Turn the thermostat down in the winter and up in the summer. Sure we want to be comfortable, but our pocketbooks say we need to be a little conservative. Put on another layer in the winter. Do things to keep you cooler in the summer. Save money. 17. Stay out of the money traps. Do you have some favorite stores that you know, no matter what, you will be dropping some cash in? You may tell yourself that you are only getting one thing or the thing you have a coupon for. Then you walk out $50 or $100 poorer. We all have trigger stores - Bath & Body Works, The Body Shop, Ulta, Harbor Freight, Target - and we need to just stay away! 18. Don't go anywhere. That's right. Stay home. If you don't have work, school, church, or family commitments, say home. If you stay home and enjoy being home with your family and things, you don't spend money. That also means enjoying your home without being on Amazon. Enjoy the things and entertainment you already have. Do not get online and buy more! 19. Grocery shop from the sales flyers. If it is on the front page of the sales flyer and your family eats it, you should be considering purchasing it. The items on the front page of a sales flyer are considered a loss leader and is generally a good stock-up price. However, show some wisdom here. If you don't eat it or don't have money in the budget for it, don't buy it. 20. Do not purchase meat that is over $2.00 a pound at the store. Meat has been crazy high-priced lately, but I still find a lot of good deals for under $2.00 a pound. Most chicken is under this price as well as a lot of pork. We eat a fair amount of both so I will buy these because they are under $2.00. The only exception is ground beef. We have a local store that will discount their ground beef after 6:00 pm and it will be $1.99-2.99 in price per pound. Otherwise, I will substitute ground pork or turkey in a lot of recipes to make the dish cheaper and save money. 21. For goodness sakes, unless it is an emergency, stop buying your coffee and tea away from home. You can literally make it at home (or work) for as little as $.30 a cup. Even you make it a little fancy and add creamer or want to froth it, you are still saving money. A $2.00 cup of coffee adds up. Getting those fancy coffees and teas adds up even more! 22. Shop from home first. We usually think we need new things or need to make a trip to the store and we probably already have something that works at home. If you feel like you need something, check at home to see if you already have something that works or you can make work. Because once you walk into the store, you will rarely just buy that one thing. 23. Go to your local library. I can not say this enough! I don't even use mine as well as I should, but my kids have no problems borrowing movies and books from them. It is a great way to see new movies and read the latest books. A lot of libraries are even giving you options for borrowing e-books from them. This is a real money saver! 24. Pay your bills on time. I know this may be difficult for some of you and I totally get that. I have been on the deep end of the broke pool before and paying bills has been hard. I have gotten behind. I have also paid a lot of money in interest and fees instead of getting my ducks in rows to pay my bills on time. Do what you can to get them paid on time and save yourself the money! 25. Eliminate subscriptions and delivery services. Really, these are the handiest things around. Sign up and pay for something to be delivered to your home instead of you having to go to the store. Sounds amazing, right? Right. Right up until you can't afford it anymore. Those meal delivery kits and more are expensive. You will probably spend way more than you would at the grocery store. There are a few that are worth the money like Dollar Shave Club (for razors only), but mostly they are the same price or more than the store. You are also probably paying for memberships and subscriptions you don't use. Cancel them now and save money! This isn't every way to save money simply and easily. However, this will get you started in the right direction. I hear so many people say they want to save money as they are buying alcohol, lottery tickets, and other personal pleasures. I usually bite my tongue, but there are many, many ways to save money if you make up your mind to do it. While I may have sounded a little harsh or showed a little tough love in my tips, I am not sorry for it. I had to learn the hard way to save money and I was shown a little tough love in some of my financial mishaps. I learned more from that than anything else. 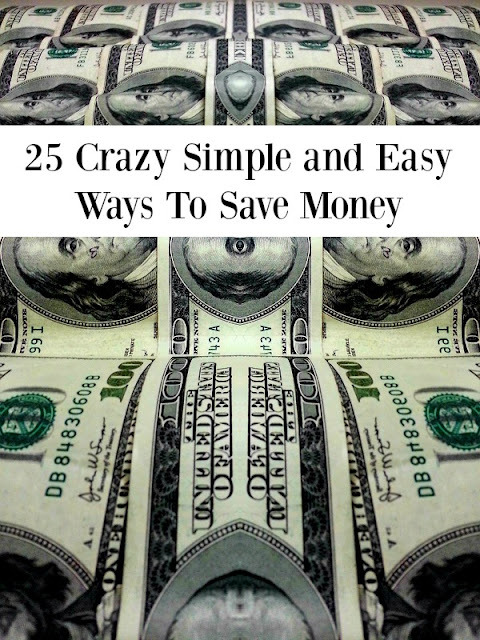 What crazy simple and easy ways do you use to save money?